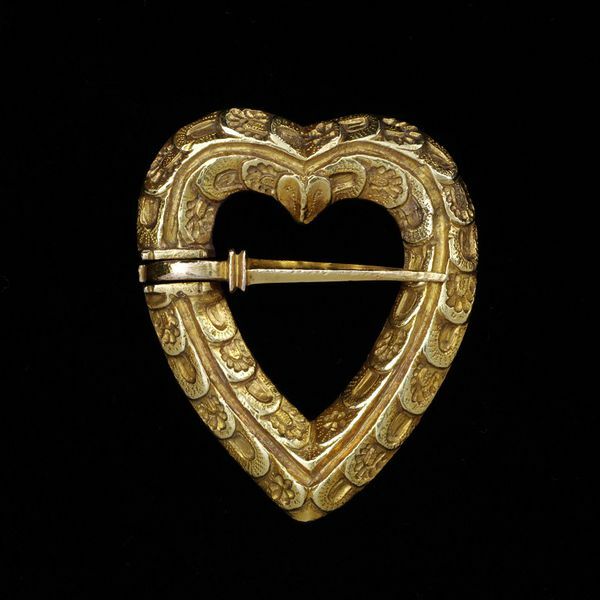 This heart-shaped brooch with its romantic inscription was given as a token of love. It would have been used to fasten a tunic, gown or cloak. Gold was the most costly of metals, generally used only by royalty and the nobility. It is inscribed and would have formerly been enamelled on the reverse in French, in black letter script, ‘Ourselves and all things at your whim’ ('Nostre et tout ditz a vostre desier'). The design on the front of the brooch, possibly stylised leaves and flowers or feathers, would also have been colourfully enamelled. Ring brooches often fastened garments with a slit at the neck. Both men and women used them. They first pulled the fabric through the ring. They then pushed the pin horizontally through the fabric. When they pulled the fabric back through the ring, it held the pin in place. Brooch, gold, of heart-shaped form. The obverse bifaceted, the facets separated by a sunken line, each facet decorated with a pattern of enriched and overlapping plumes. Engraved on the reverse in a dentillated border is the black-letter inscription 'NOSTRE ET TOUT DITZ A VOSTRE [D]ESEIR' (Ours and always at your desire), each word separated by a small floral sprig. Brooch, gold, heart shaped. France or England, about 1400. Lightbown, Ronald. Medieval European Jewellery: with a catalogue of the collection in the Victoria & Albert Museum. London: Victoria & Albert Museum, 1992. cat. 26. p. 498.